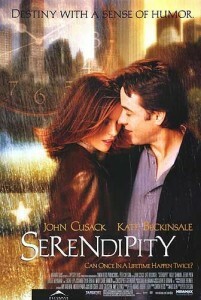 Apa yang bikin gue suka nonton Serendipity berulang-ulang kali ? >“if we are to live life in harmony with the universe, we must all possess a powerful faith in what the ancients used to call “fatum”, what we currently refer to as destiny”. Kita memfavoritkan film yang sama. Tidak ada kebetulan dlm hidup ini.